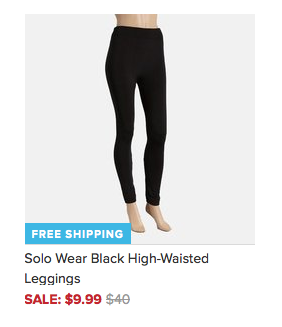 Solo Wear Printed Leggings Only $9.99 + FREE Shipping (Reg. $40)! You are here: Home / Great Deals / Solo Wear Printed Leggings Only $9.99 + FREE Shipping (Reg. $40)! I absolutely love leggings – they are so versatile – wear them with a long button down shirt, for a workout, or just around the house, doesn’t matter! And right now, these Solo Wear Printed Leggings are Only $9.99 + FREE Shipping (Reg. $40)! They have tons of colors/designs to choose from!